Happy Monday! I hope everyone had a wonderful fall weekend. I couldn't believe how chilly it was in Ohio- it makes me so excited for fall! This weekend was so busy that I didn't get a chance to write about the fun light investigations that my class did on Friday. My kiddos had an absolute blast and learned so much! The light investigations are five different investigations that the kids rotate through. 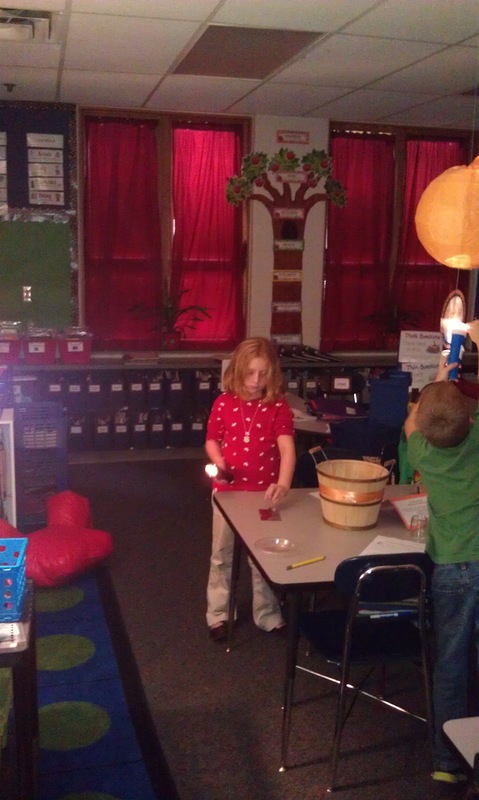 Almost all of them involve the use of flashlights and we turn out the lights in the classroom. I even blocked the windows by pulling my class curtains shut. It felt like we were in a cave! At the first investigation, students learn how shadows are made by standing in front of our overhead projector (yes, my classroom is still old school and we have one of these!). I tell them that this is the one time they can stand in front of the overhead and make shadow puppets, etc. 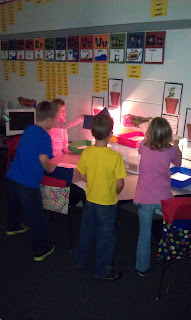 They love it and learn that shadows are made when light gets blocked by an object. At the second investigation, students use flashlights to shine light onto many different objects. They have to sort them into three different groups- light gets absorbed (opaque), light goes through (translucent), and light bounces off (reflects). Some of the objects I put at this investigation include a block of wood, a clear cup, a spoon, a magnifying glass, a mirror, clear containers, and a tin container. The third investigation has the students observing a pencil in a cup of water. The pencil looks broken or crooked because when light waves travel through water, they bend and cause objects to look different. The kids learn that this is called an optical illusion. At the fourth investigation, students learn that dark colored objects get hotter than light colored objects. They investigate what happens when they hold a black and white piece of paper over a lamp. The black paper gets hotter because it absorbs more light. 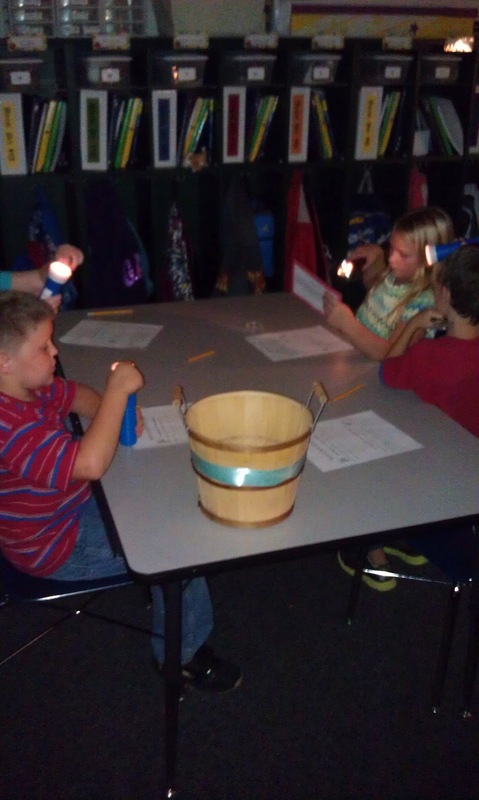 At the last investigation, students explore what happens when you shine light through a magnifying glass. When they do this, they can see that the light waves bend. They can also see a rainbow so we talk about how light is made up of all the colors of the rainbow. 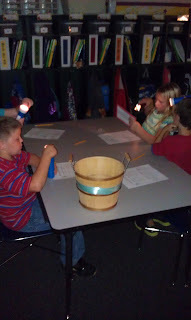 I give the students five minutes to explore at each center and then they have five minutes to write one fact that they learned about light from the investigation. I love teaching this unit about light because it allows the kids to explore and be "scientists"! If you'd like to learn more about these light investigations, you can check out my product by clicking on the image below. can apply online to Men2hire for. And if you are not ready for it, then believe it, your boredom will stay. more favourable characteristics. Maybe it is arrogant to want to become a hero, but I find it a noble aspiration. with the acting talents of Andy Serkis- and it's easy to forget that Caesar isn't real. they will learn something about our country in the process. It's almost always easy to make a joke about the way a cat ends up lying down or sitting. The videos relax, they make people smile and as they say, laughter is the best medicine. One last thing that isn't mandatory but recommended is to set up a Pay - Pal account to process your payments. Menopause weight gain is not inevitable, but it can be more difficult to maintain a healthy weight as your metabolism slows. to do, we would mostly go on the internet and watch some funny pictures. I've listened to this a dozen or more times and still find it delightful and sooooo original in concept. I have more stuffings in me from yesterday than I care to think about. It the radio was the only one that used to deliver the days news and weather updates. stuffings in me from yesterday than I care to think about. Committee on Gulf War and Health: Health Effects of Serving in the Gulf War, Update 2009.
you have here on this post. I'll be returning to your site for more soon. for your excellent info you've got here on this post. I will be returning to your website for more soon.